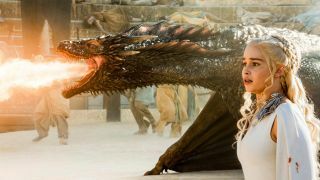 There can be no doubt that the Game of Thrones dragons are integral to the show’s climax now Game of Thrones season 8 is here. Many suspected that would be the case as far back as 1996, when George RR Martin’s now legendary A Song of Ice and Fire books debuted; yet few series prophets correctly foresaw Daenerys Targaryen’s flame-breathing descendants unleashing the ice as well as the fire. Pity poor, unknowing Viserion. Yet how exactly did we get to this point, and what will become of the undead Vis and his very much alive siblings Rhaegal and Drogon as season 8 unfolds across six episodes spanning a staggering 432 minutes? That pair of key questions are among those answered by our Game Of Thrones dragons guide. Below you’ll also discover the significance carried by each of the trio’s mysterious, mystical names, all of which have a Targaryen connection; what happened to the fire-breathing triple-threat’s ancestors long before the show’s story began; and how you can own Viserion, Rhaegal, and/or Drogon without having to wage battle against Dany. Because let’s face it, you’d have less-than-zero chance on that front. Who are the Game of Thrones dragons? The Game of Thrones dragons are Drogon (black and red), Rhaegal (green and bronze), and Viserion (cream and gold). Drogon is Daenerys’ personal mount. He’s named after Dany’s husband Khal Drogo, whose death in Game of Thrones season 1 ultimately triggered the Game of Thrones dragons’ birth. Rhaegal takes his moniker from Rhaegar, Daenerys’s eldest brother who died before she was born and we were finally introduced to in a Game of Thrones season 7 flashback that confirmed Jon Snow is his son – and Dany’s nephew. Viserion is named for Viserys, Dany’s other sibling who met his end at the hands of Drogo in one of Game of Thrones’ most satisfying deaths. When did the Game of Thrones dragons first appear in the show? The Game of Thrones dragons first appeared at the climax of season 1, following the death of Daenerys’s husband Khal Drogo. Earlier in the season, Dany was given three eggs by Illyrio Mopatis to commemorate her marriage to Drogo. She kept these eggs close by at all times, eventually placing them on Drogo’s funeral pyre following his death. Devoid of hope after losing her newborn and having to end Drogo’s life, Dany walked into the raging inferno – leaving Ser Jorah Mormont to assume her dead. Instead, she emerged onto the wastelands beyond Lhazar next morning with three baby dragons clinging to her. What happened to the other Game of Thrones dragons? 5,000 years before the show began, men of the Valyrian Freehold – Dany’s ancestors – used dragons to wage war across Essos, Westeros’ neighbouring continent. Yet they were almost entirely wiped out in a volcanic event known as the Doom of Valyria, which just one noble family – the Targaryens – survived. Aegon the Conqueror is the last known Targaryen to have called upon dragons, and used the final three in existence to unify the Seven Kingdoms. In the ASOIAF books the last dragon is a small, sickly green female who gave birth to five eggs that never hatched. The show isn't quite that specific about its final dragons, but Tyrion tells a similar story about them being "the size of cats" in Game of Thrones season 6. Game of Thrones season 1 begins around a century later, with the creatures long extinct, and petrified dragon eggs the only thing left of the species. These are assumed to be decorative, but Dany senses that may not be that case upon receiving Illyrio’s gifts. Sure enough, the season 1 finale sees the species resurrected in spectacular fashion. Where are the Game of Thrones dragons now? Ahead of season 8, two are alive. One is dead… and yet more dangerous than ever. Viserion, however, wasn’t left to rest in peace. The wights heaved him from the lake to be reanimated by the Night King, and the now blue-eyed wonder closed out the season by destroying Eastwatch-by-the-Sea’s castle and a huge portion of the Wall with icy blue fire – enabling the undead army to swarm into the Seven Kingdoms. How will the Game of Thrones dragons affect season 8? ‘All men must die’ is a recurring Thrones theme, and don’t be surprised if season 8 extends the ‘men’ rule to ‘scaly creatures with Targaryen connections’. Viserion murdering a sibling would further establish the Night King’s thirst for evil, and be so very GRRM – our money is on Dany’s beloved Drogon getting ice-fired into oblivion. But this is also a TV show about spectacle, and one of the biggest set pieces imaginable in season 8 is the toppling of an undead dragon. So expect Viserion to fall too, possibly at his own mother’s hand. Naturally, countless fan theories surrounding their future also exist. One very plausible Reddit notion is Drogon killing Viserion, in a callback to Drogo ‘crowning’ Viserys in season 1. How do I get my own Game of Thrones dragon? A variety of essential dragon merch is available, although frustratingly HBO recently closed its UK and EU online stores – so dragon hunters in those territories must use third parties like Forbidden Planet or Amazon instead. For the fan with plenty of Westerosi coin to spare, this 14” x 18” statue of Dany and Drogon has excellent reviews – though you’d expect it to, at an RRP of $349/£360. Slightly more affordable is a resin Viserion egg: the perfect mantelpiece tribute to the fallen sibling at $54/£40.